Is there a non-dairy substitute for Parmesan cheese? You bet! 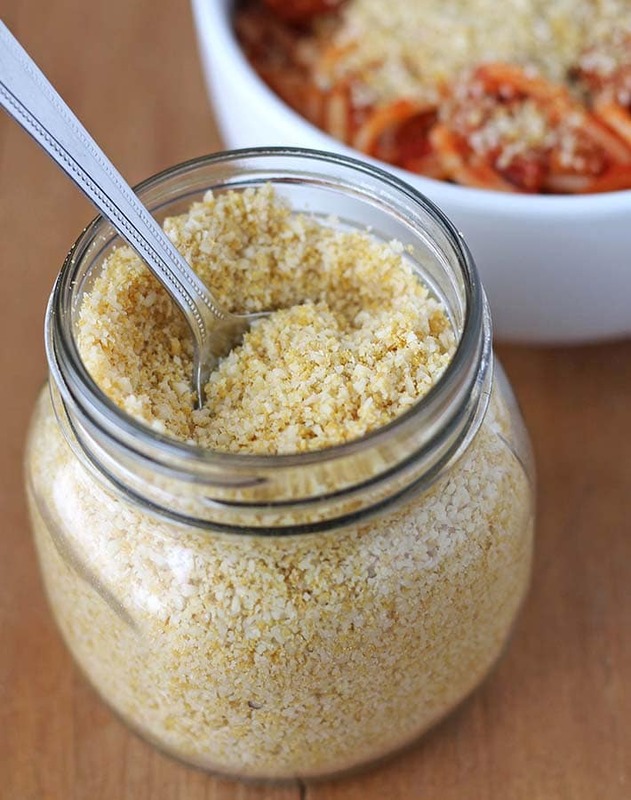 5 minutes and 5 simple ingredients is all it takes to make this easy homemade vegan Parmesan cheese. It’s the perfect cheesy vegan sprinkle for everything! (Seriously, though…EVERYTHING!). I think it’s pretty safe to say that when most people are switching over to a plant-based / vegan diet, the one thing that most struggle with is CHEESE. Am I right? For some, it’s an easy thing to drop…cheese one day, no more cheese the next. But because dairy cheese can be such an addictive food, many struggle. WERE you or ARE you this way? 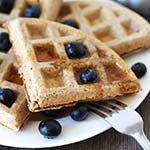 The good news is that there are so many amazing vegan dairy substitutes out there (check out this big list of cheese substitutes and other vegan substitutes for common kitchen staples). I’ve also shared recipes for garlic herb vegan almond cheese spread and an almond cheese ball that you may like! I will be honest and say that nothing will replicate the taste and texture of dairy cheese exactly, but there are some alternatives that come pretty close…like this vegan (and naturally gluten-free!) Parmesan recipe. 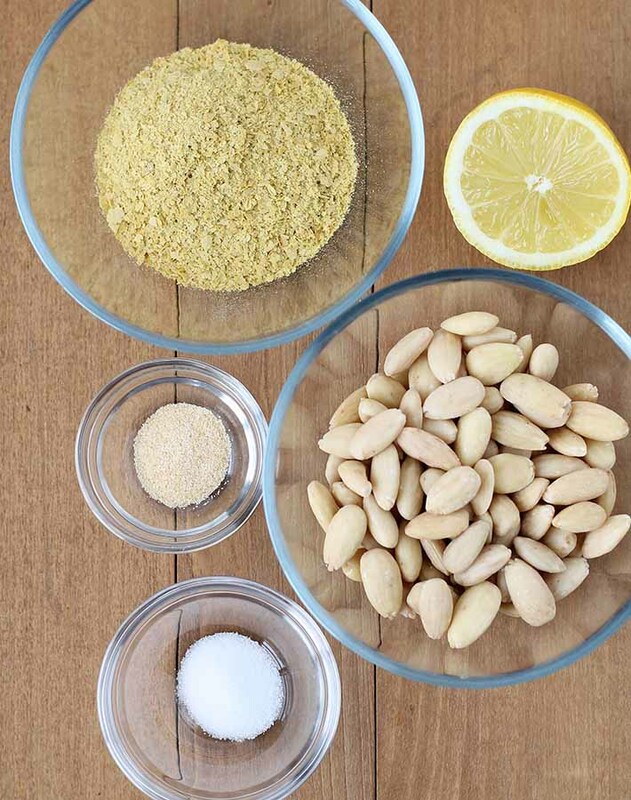 Set aside five minutes and the following ingredients and you’ll have yourself a pretty delicious substitute for Parmesan cheese. There are two things you’ll notice about the ingredients for this recipe that’s a little different from other vegan Parmesan substitute recipes out there. One: In addition to the nutritional yeast and other ingredients, I’m using raw, blanched almonds. I can’t have cashews, so I use almonds in most places they’re called for. Two: There’s lemon juice in this recipe. YES! Lemon juice! There is a prepared vegan Parmesan brand at my grocery store that’s made with pumpkin seeds, spices, and citric acid, an ingredient used as a natural preservative and to add a sour taste to foods and soft drinks. So I thought that lemon juice would be a good sub…because while you can buy citric acid for your recipes, it’s not something I keep in my cupboards. Lemons, however, I always have. In this recipe, the lemon juice adds a slight sourness to the Parmesan to mimic the flavour of the real thing. How Do You Make Vegan Parmesan? Is a Food Processor Necessary? It’s not absolutely necessary, but highly recommended. You can make it in something like a NutriBullet, a regular blender, or a high speed blender like a Vitamix, but I prefer the results I get from my food processor and I also like the control I have over the processing. 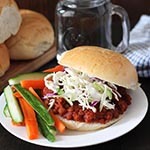 With the food processor, I can pulse to get the crumbly texture I like and I don’t run the risk of over over-processing which is a no-no. Why? Anyways, if you’re looking to get a good, high-quality food processor, this is the one I own and love. You mean other than eating it out of the jar with a spoon? Because, trust me, you may find yourself doing that exact thing now and then. I think it’s THAT good and that it’s the best vegan Parmesan! 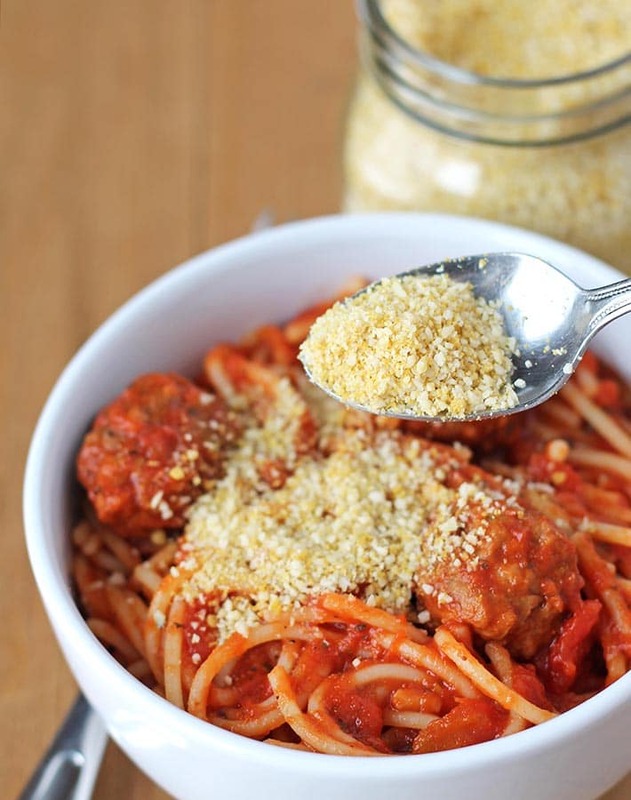 My favourite way is sprinkling a generous amount over spaghetti and veggie balls like in the pic above. 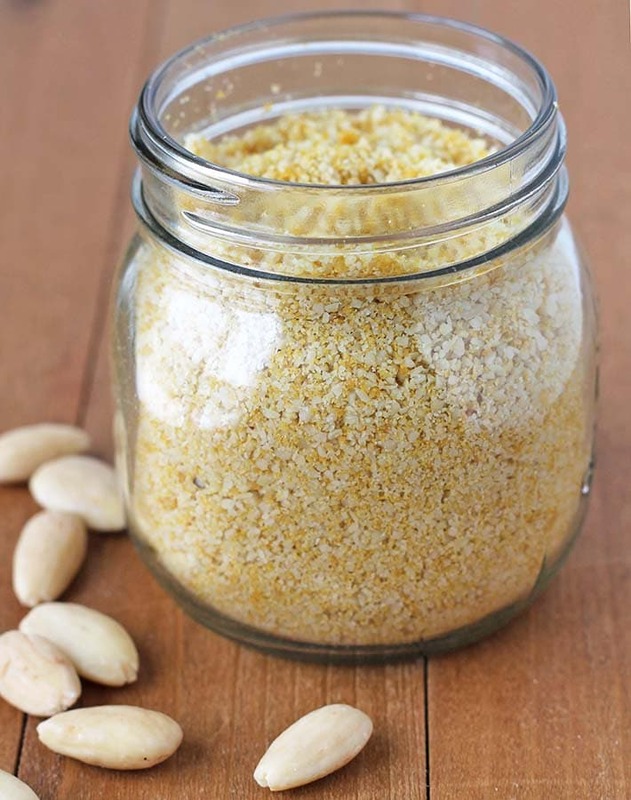 Can Vegan Parmesan Cheese Be Made Nut-Free? Yes! If you need to stay away from nuts, you can substitute raw, unsalted pumpkin seeds or raw, unsalted sunflower seeds for the almonds. The texture will be slightly different but I’ve tried both and the taste is just as good. 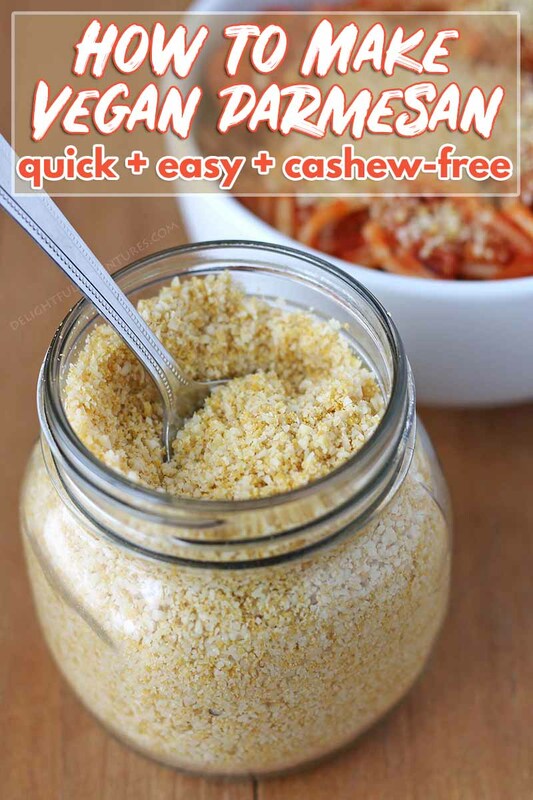 If you make this vegan Parmesan cheese, tell me what you like to sprinkle it on! Leave a rating and comment below or you can also share a pic with me on Instagram. 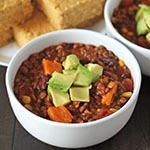 You can also pin this recipe to your Pinterest recipe board to help others find it. 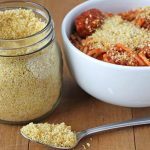 5 minutes and 5 simple ingredients is all it takes to make this easy homemade vegan Parmesan cheese. It's the perfect cheesy vegan sprinkle for everything! 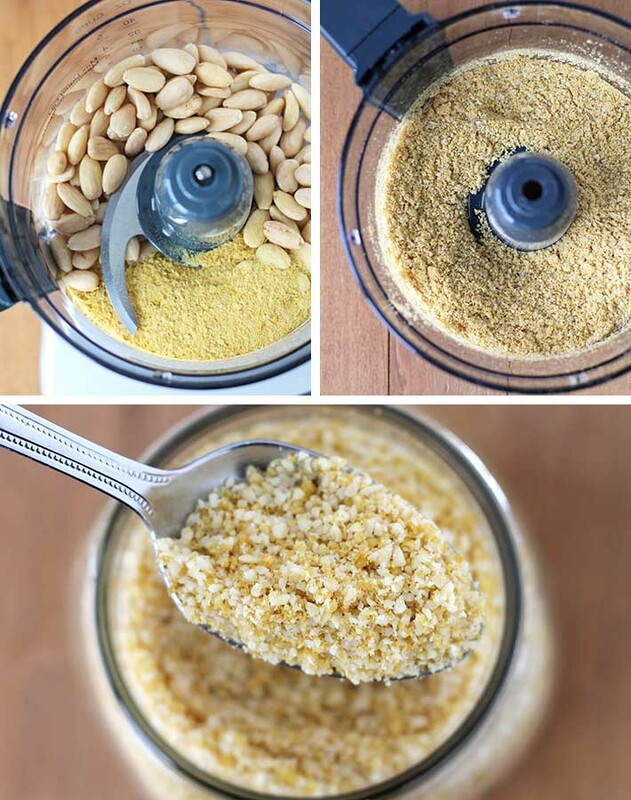 Add almonds, nutritional yeast, garlic powder, and salt to your food processor. Process for a few seconds until mixture has turned fine and crumbly like in the images above. Add lemon juice to the mixture and pulse until it has been evenly distributed. Recipe makes 1 + 1/3 cup. The almonds do NOT need to be soaked for this recipe. Do not to over process or the oil from the almonds will release and you will end up with a wet, sticky mixture that is on its way to becoming cheesy almond butter. Be sure you're using garlic powder and not garlic salt or garlic granules. This vegan Parmesan will last for up to a month in the fridge. Nutrition info is based on 1 serving (1 tablespoon) and on the recipe made as it is written. Nutrition info is only to be used as a rough guide. Click to learn how nutrition info is calculated on this website.